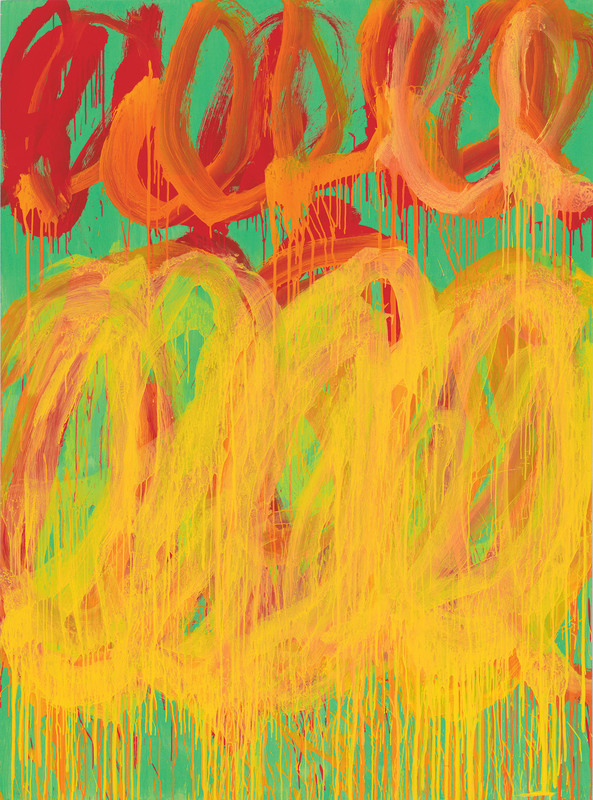 This posting is for a friend who is a great Twombly fan. “Quite an amazing installation… who would have thought #6 being placed there. The text(?) which replaces the position of the “main” elements in #4, #5 sets the position of #6 – what a choice! 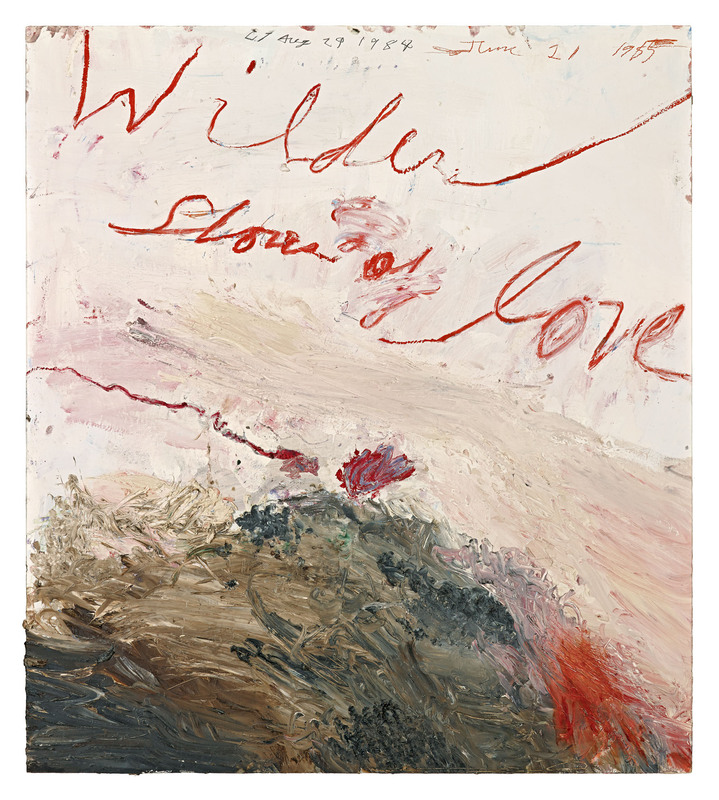 It would take years to understand the intricacies of Twombly’s work, but the main archetypes that we can all interpret are there: themes such as love, war, death and night. This is a visceral art of smudges, smears, and inscriptions. It is art that tells a story, an art that emotes? evokes deep inward feelings while challenging the intellect. Many thankx to the Centre Pompidou for allowing me to publish the artwork in the posting. Please click on the art work for a larger version of the image. 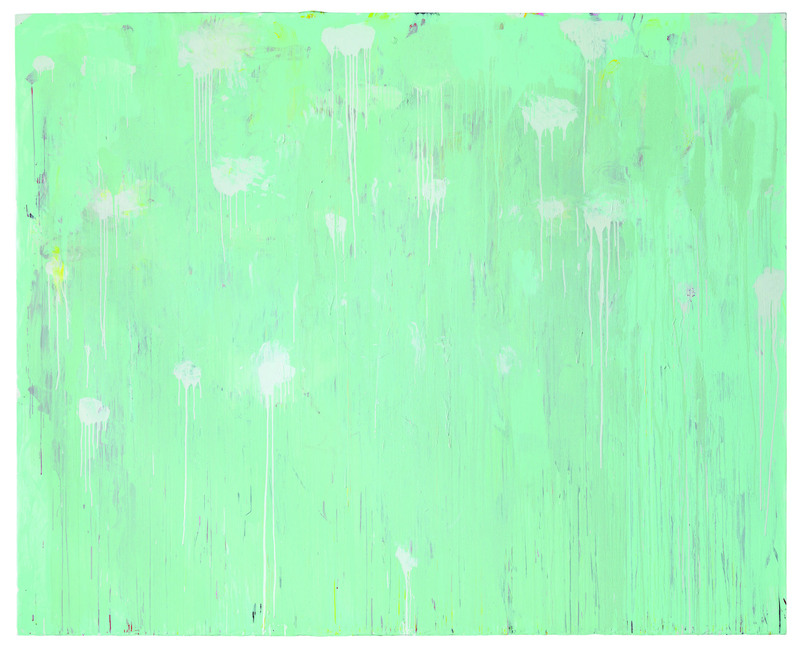 “The Centre Pompidou is presenting a major retrospective of the work of American artist Cy Twombly. A key event of the fall 2016, this exceptionally vast exhibition will only be shown in Paris, and will feature remarkable loans from private and public collections from all over the world. Organized around three major cycles – Nine Discourses on Commodus (1963), Fifty Days at Iliam (1978) and Coronation of Sesostris (2000) – this retrospective covers the artist’s entire career in a chronological circuit of some 140 paintings, sculptures, drawings and photographs, providing a clear picture of an extraordinarily rich body of work which is both intellectual and sensual. 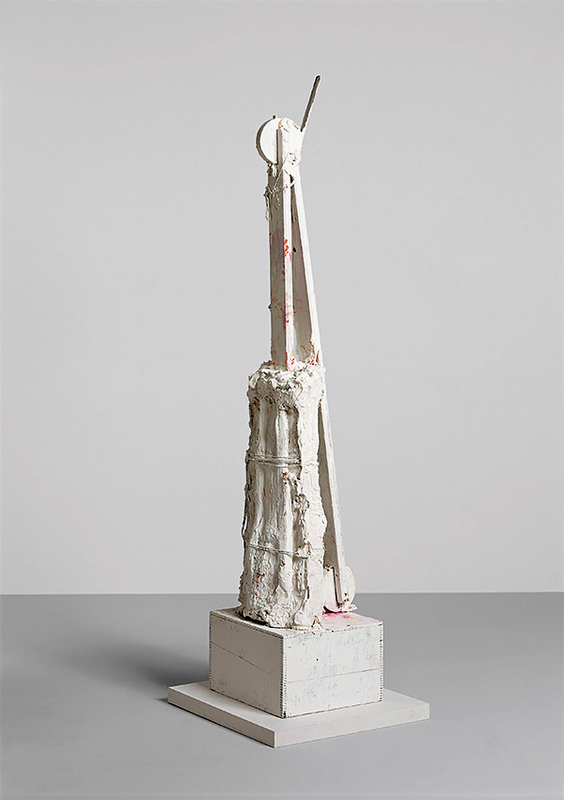 The selection includes many of Twombly’s iconic works, several of them never previously exhibited in France. 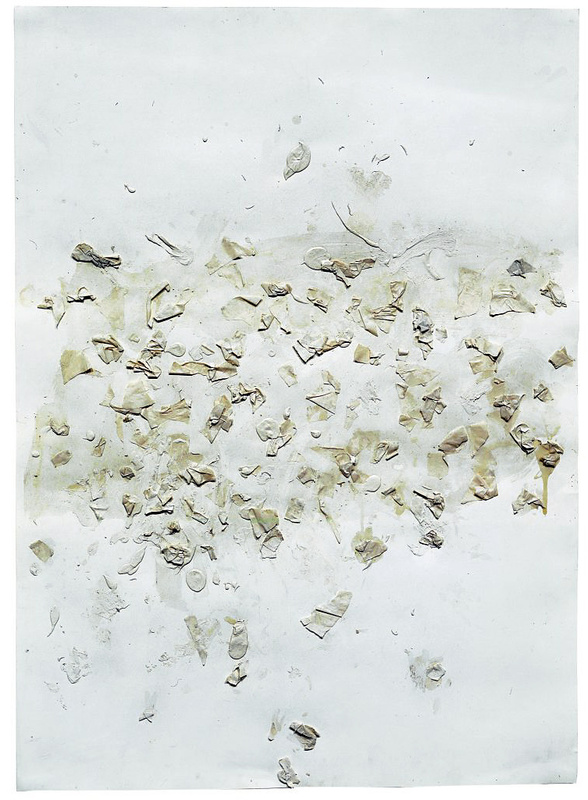 © Cy Twombly Foundation, courtesy Galerie Karsten Greve, St. 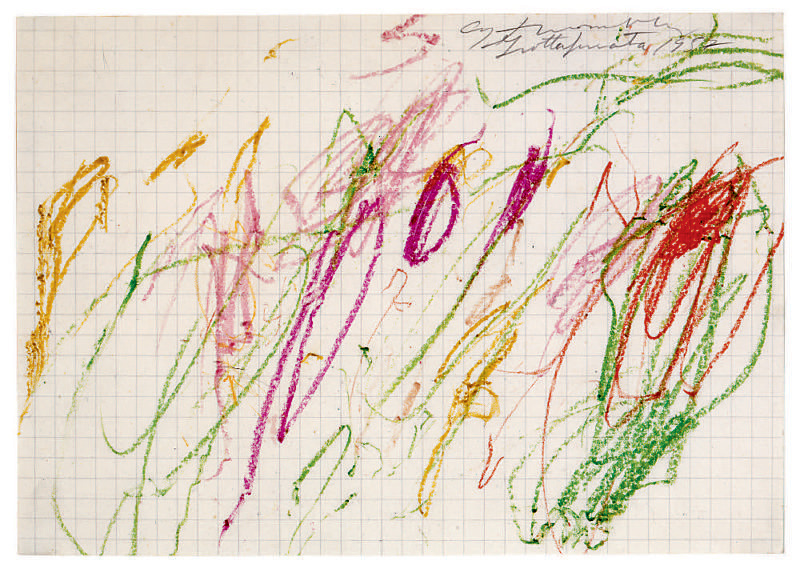 The 1950s saw Twombly evidence a precocious maturity. After leaving Black Mountain College – the experimental liberal arts college in North Carolina where he encountered the crème de la crème of the US avant-garde – the 24-year-old painter from Lexington, Virginia, set off on a trip to Europe and North Africa in the company of Robert Rauschenberg. On returning to New York in late spring 1953, he produced his first major works, the sounds of their titles recalling villages and archaeological sites of Morocco. 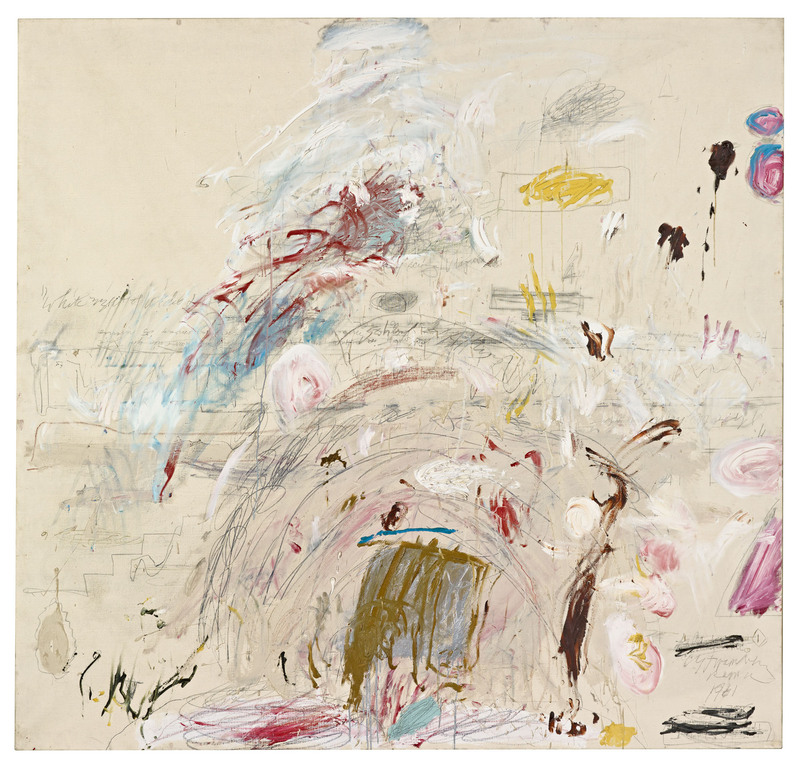 These were followed by white canvases covered in script – Twombly disliked the term “graffiti” employed by many of the critics – and its suggestion of triviality. The masterpiece of the decade is undoubtedly the series of white paintings done at Lexington in 1959, which Leo Castelli however refused to show. The austerity of their pictorial language makes outstanding works, economy of means being pushed to an extreme in the combination of white house paint and pencil. 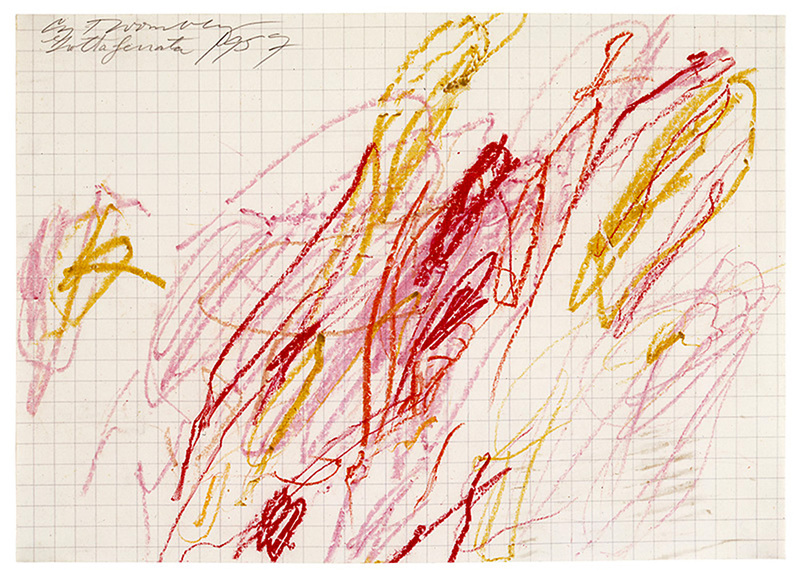 In the summer of 1957, Cy Twombly returned to Italy to visit his friend Betty Stokes, who was married to Venetian aristocrat Alvise Di Robilant and had just given birth to their first child. 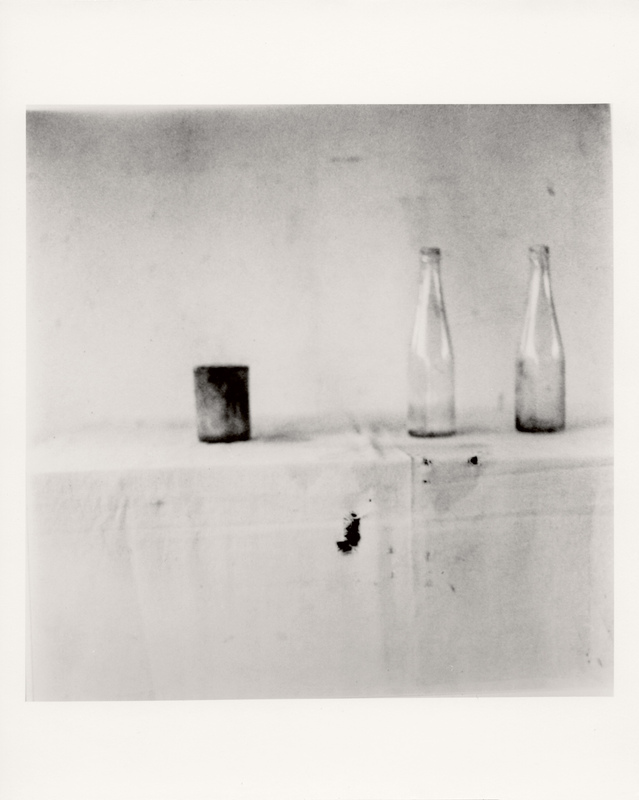 The Robilants were then living at Grottaferrata, where Twombly took several photographs of Betty. During his stay, he also made a series of eight wax crayons drawings, which he presented to her. One of these has since been separated from the group, leaving only seven, outstanding in their vigorous hand and lively colour. Describing space in Twombly’s work, Barthes uses the term ‘rare’ (Latin, rarus): ‘that which has gaps or interstices, sparse, porous, scattered’. 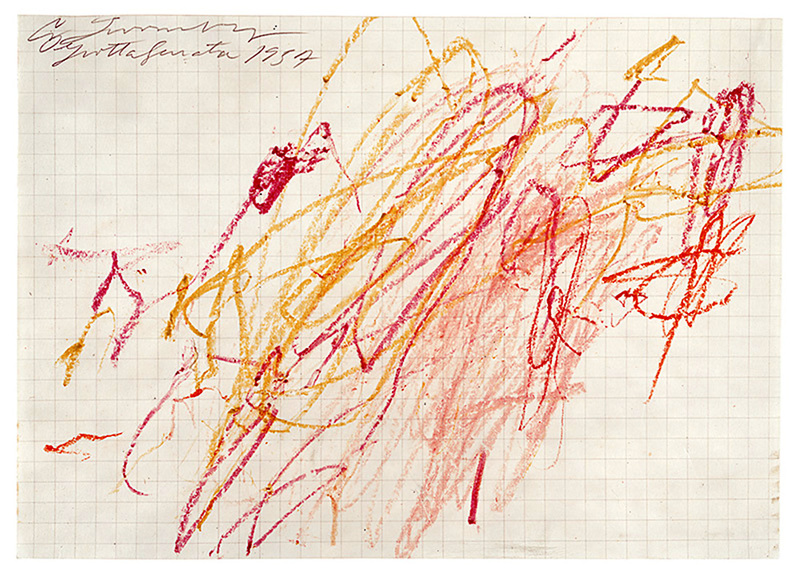 Roland Barthes famously wrote of Twombly: ‘His work is based not upon concept (the trace) but rather upon an activity (tracing)’. 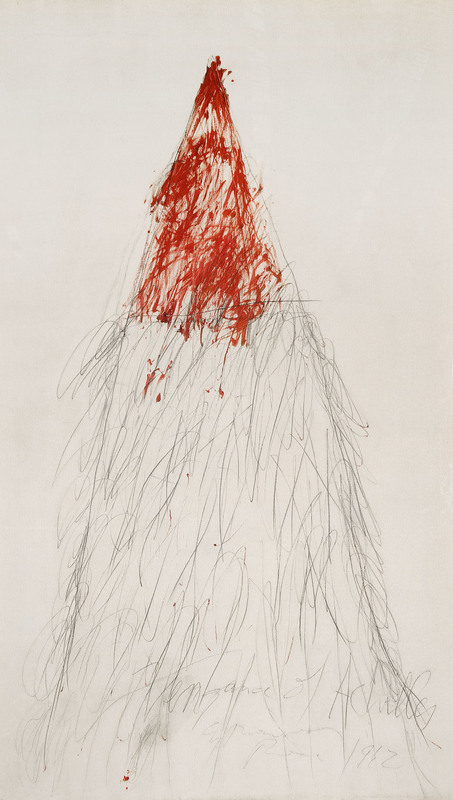 In Twombly’s graphic art, the trace is the record of a gesture. Barthes again: ‘line is action become visible’. 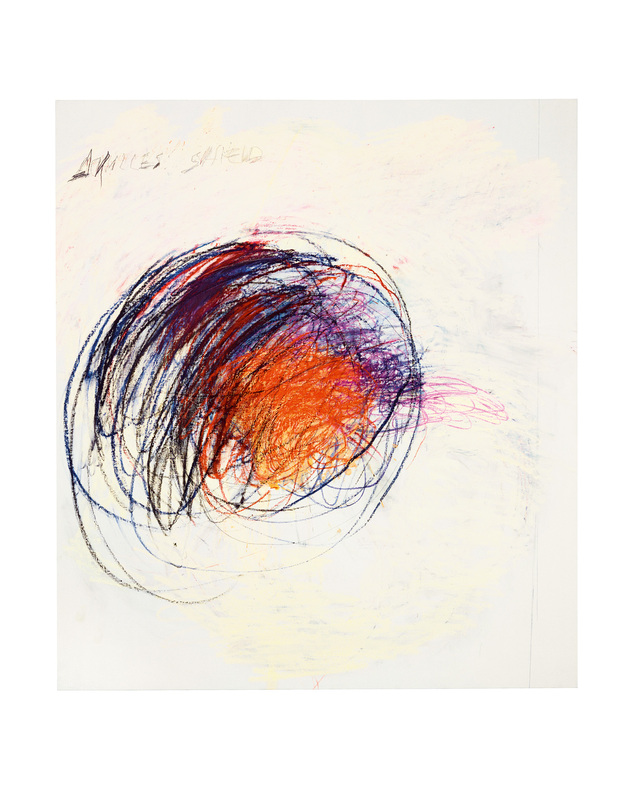 Like Olson, Twombly connects heart to line via the body. After Twombly’s marriage to Italian aristocrat Luisa Tatiana Franchetti, celebrated in New York on 20 April 1959, the couple settled in Rome, living in a palazzo on the Via di Monserrato, in a quarter known for its intellectual life. Twombly had just given up using his fluid and viscous house paint for oil paint in tubes with precisely the opposite properties. Between 1960 and 1962 he produced some of his most sexual paintings, Empire of Flora being an evocative example. Partial glimpses of body parts, male and female, are scattered over canvases that seem to preserve the sensual memory of hot Roman nights. 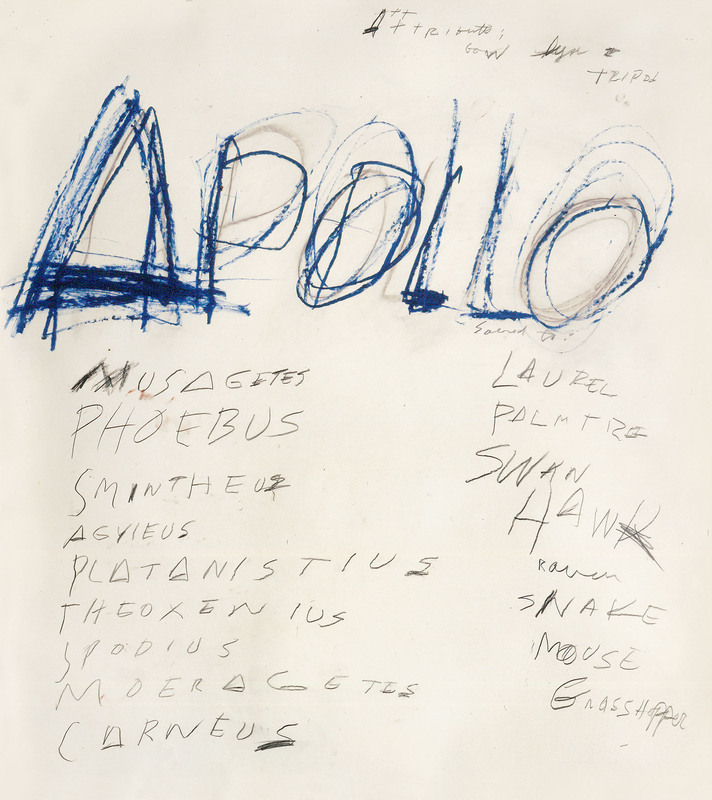 In late 1963, when John F. Kennedy was assassinated in Dallas, Cy Twombly devoted a cycle of nine paintings to the Roman emperor Commodus (161-192), son of Marcus Aurelius and remembered as a cruel and bloodthirsty ruler. 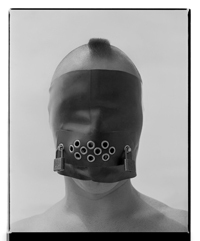 In these he conveys the climate of violence that prevailed during his reign, marked by executions and terror. 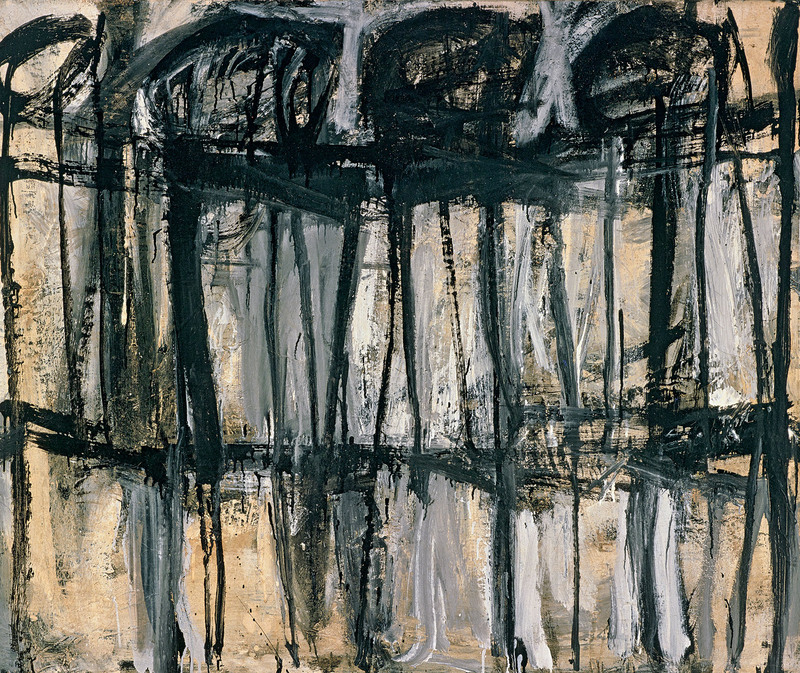 Shown at Leo Castelli’s in New York in the spring of 1964, the paintings were roundly condemned by the critics. 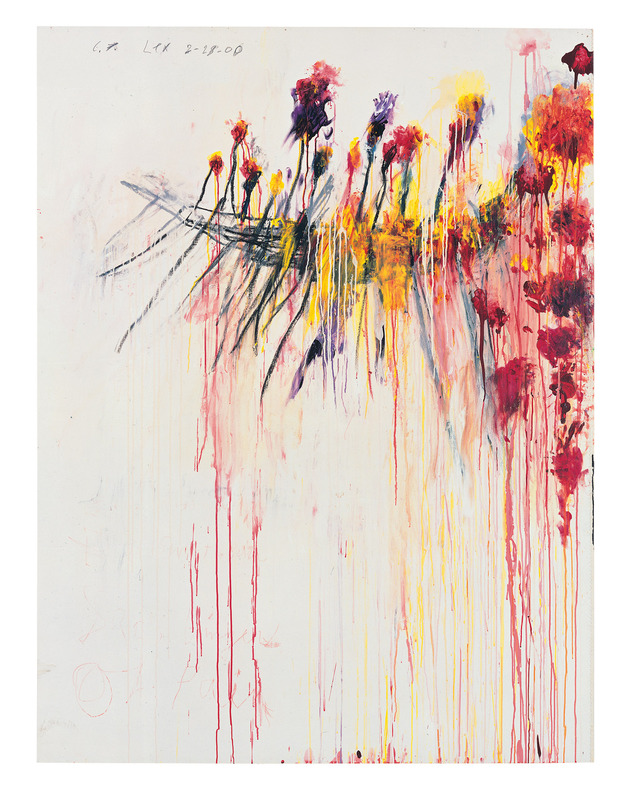 Won to the newly emergent Minimalism, the New York public was unable to grasp Twombly’s painterly gifts and his ability to render on canvas the complex psychological phases informing the life and death of the emperor. 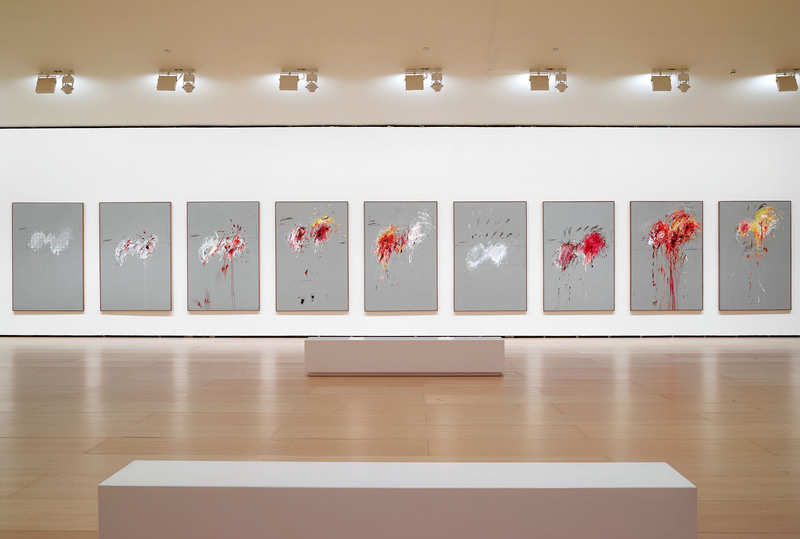 At the close of the exhibition, Twombly recovered the paintings, which would be sold to an Italian industrialist before being acquired in 2007 by the Guggenheim Museum, Bilbao. 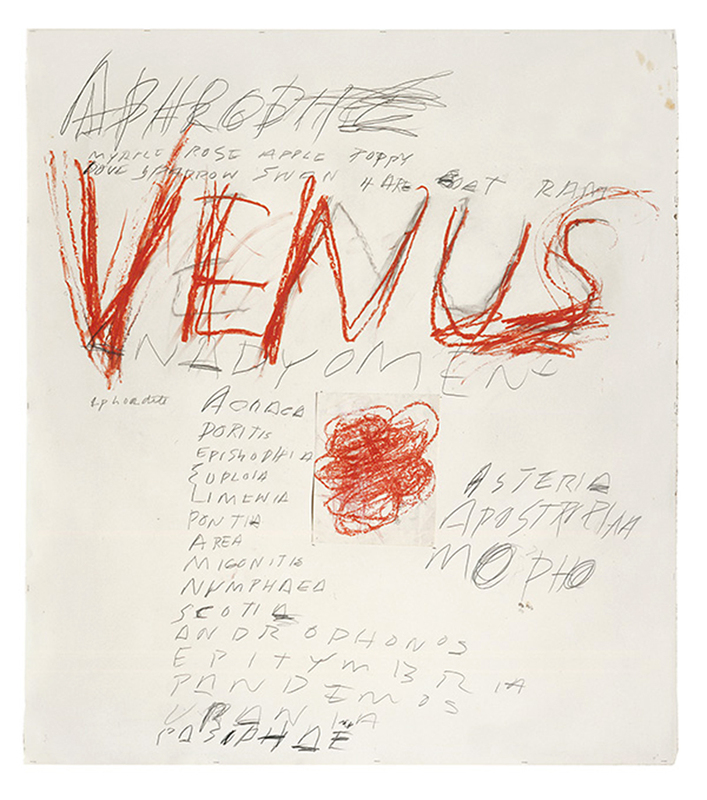 Having painted a series under the sign of Eros in the very early part of the decade, in 1962 Twombly turned to Thanatos, death, a theme that finds paroxysmal expression in his first two meditations on the Trojan War, Achilles Mourning the Death of Patroclus and Vengeance of Achilles. In these two paintings, brought together for this exhibition, Twombly gives form to Achilles’ sorrow and fury on the death of his friend. The Ilium triptych, for its part, was broken up at an unknown date, the first panel joining the Eli and Edythe Broad collection in Los Angeles. In the early 2000s, Twombly painted a new version of that panel to recreate the triptych, then owned by collector François Pinault. Courtesy Jeffrey Hoffeld Fine Arts, Inc.
Walter Benjamin’s 1917 essay, ‘Painting, or Signs and Marks’, argues that, ‘The graphic line is defined by its contrast to area’ as opposed to the mark (‘Mal’) and painting (‘Malerei’): ‘the realm of the mark is a medium.’ His distinction between line and mark, drawing and painting, is especially hard to maintain in relation to Cy Twombly: the scribbled pencilling, the smudges and smears, are the marks of an affective body used as a writing instrument. Where Benjamin speaks proleptically to Twombly is in the decisive role he gives to writing, inscription, and naming, along with the spatial marks on monuments and gravestones. 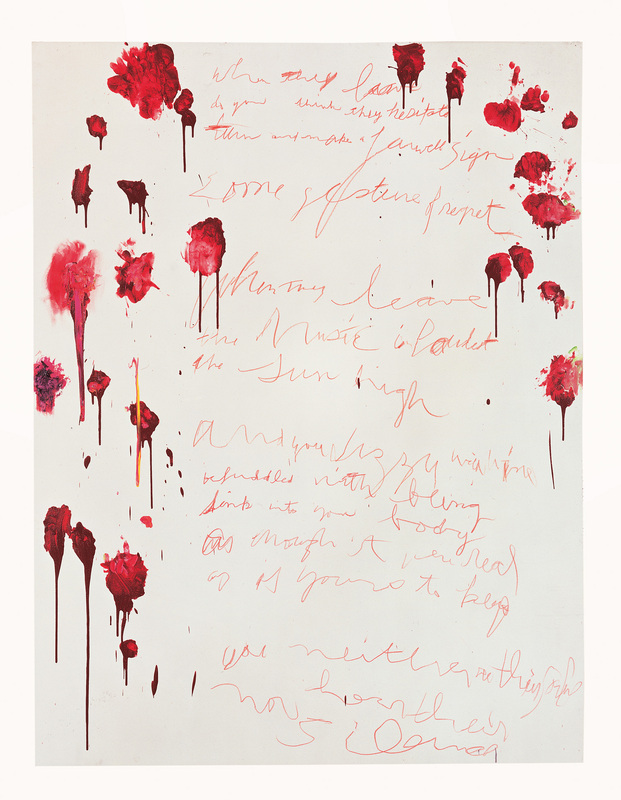 ‘[T]he linguistic word’, he writes, ‘lodges in the medium of the language of painting.’ With its collage of quotations, inscriptions, and names, Twombly’s entire oeuvre could be read as a retrospective commentary on this early Benjamin essay. 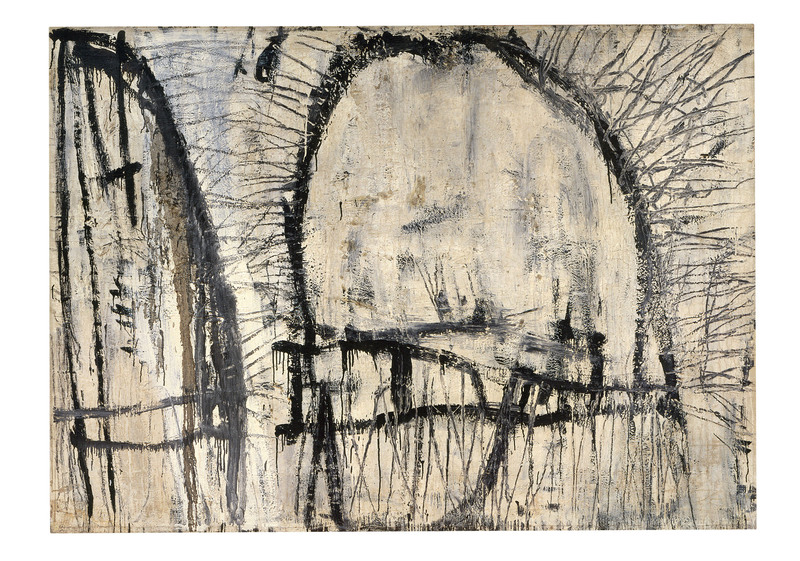 Reacting to the Minimalism and Conceptualism that emerged in the United States in the 1960s, in 1966 Twombly, then living in Rome, embarked on a new series of remarkably austere paintings, with backgrounds of grey or black inscribed with simple forms or script-like loops in white wax crayon. He showed these at the Galleria Notizie, Turin, in early 1967. In the autumn, Leo Castelli in New York exhibited a second series, painted in January in a Canal Street loft made available to the painter by curator and collector David Whitney. Among the works shown was Untitled (New York City) (1967, cat. No. 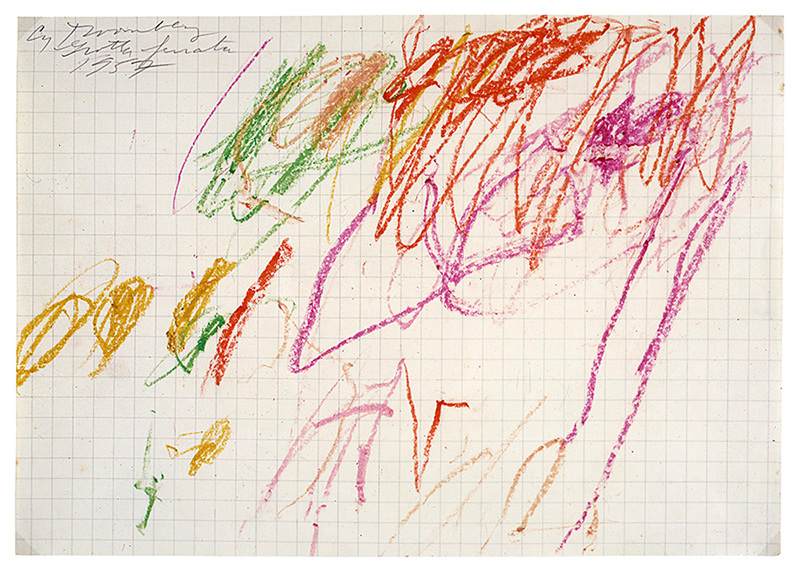 75), which Twombly would later exchange with Andy Warhol for one of his Tuna Fish Disasters. 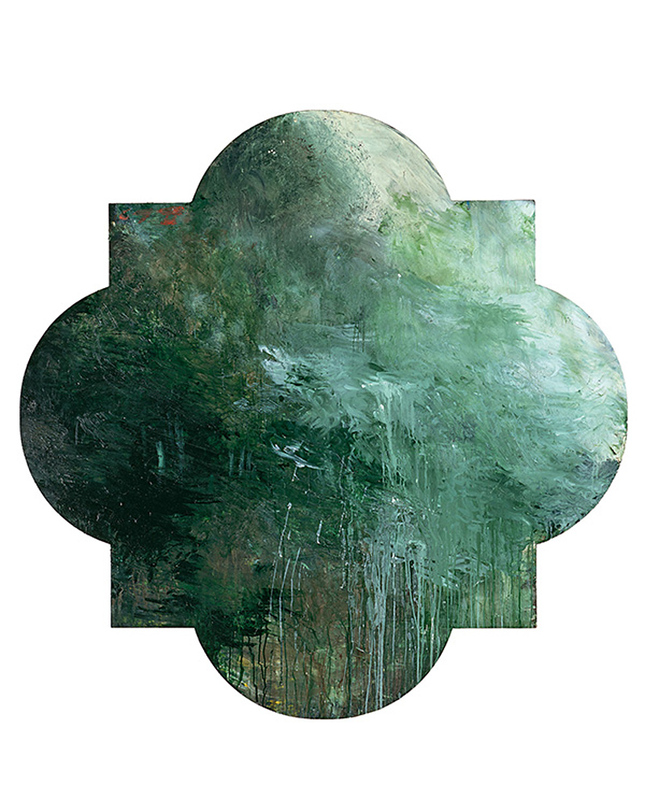 In 1975, Cy Twombly bought a 16th-century house at Bassano in Teverina, north of Rome, and after basic renovations he established his summer studio there. Inspired by Homer’s Iliad, read in Alexander Pope’s 18th-century English translation, he embarked in 1977 on the major cycle “Fifty Days at Iliam,” whose ten paintings were completed over two successive summers. In the word “Ilium”, one of the ancient names for Troy, Twombly replaced the U with an A, preferring the sound. For him, the letter A evoked Achilles, the Greek hero to whom he had devoted two paintings in 1962. 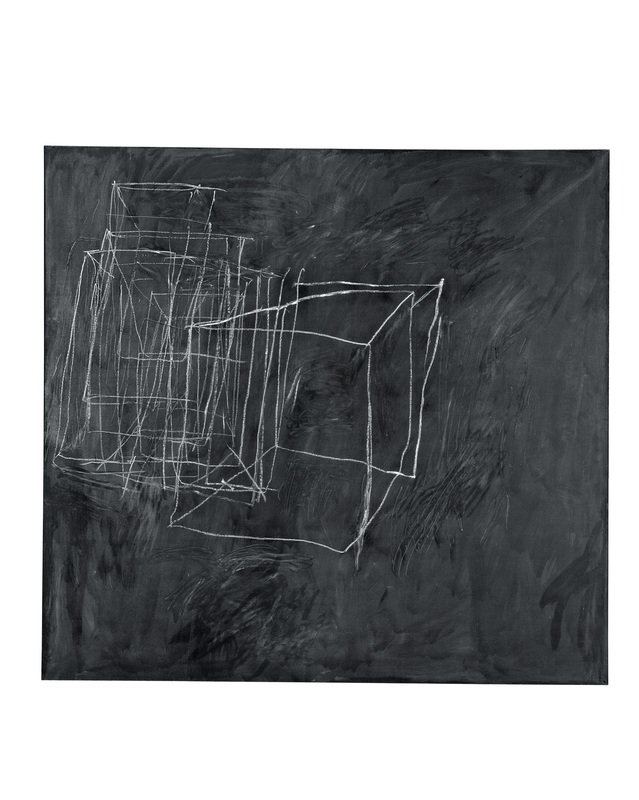 After being shown in 1978 at the Lone Star Foundation (now Dia Art Foundation) in New York, the work remained boxed up for 10 years, to be seen again only upon its purchase in 1989 by the Philadelphia Museum of Art, where it is on permanent exhibition in a room devoted to Cy Twombly. This exhibition marks the first time it has been shown in Europe. 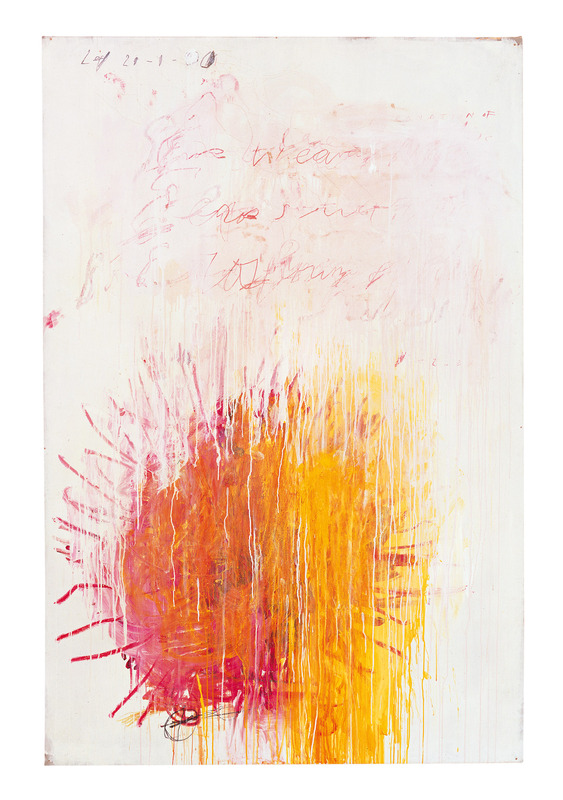 “Coronation of Sesostris” is one of the major painting cycles that punctuate Cy Twombly’s career, differing from the purely abstract series in their incorporation of narrative elements. Inspired by the example of the god Râ, whose sun-boat traverses the heavens from dawn to dusk to the end of night, Twombly opens the series with luminous canvasses dominated by sunny yellow and red to close it in black and white with an evocation of Eros from a poem of Sappho’s: “Eros weaver of Myth / Eros, sweet and bitter / Eros, bringer of pain.” Twombly combines fragmentary references to Sesostris I, to ancient Greek poets Sappho and Alcman, and to the contemporary poet Patricia Waters. Begun at Twombly’s house in Bassano, this cycle was completed after the canvases were shipped to Lexington. Sally Mann’s photographs show canvases of different sizes tacked to the walls of the little studio, showing that they were stretched only when finished. 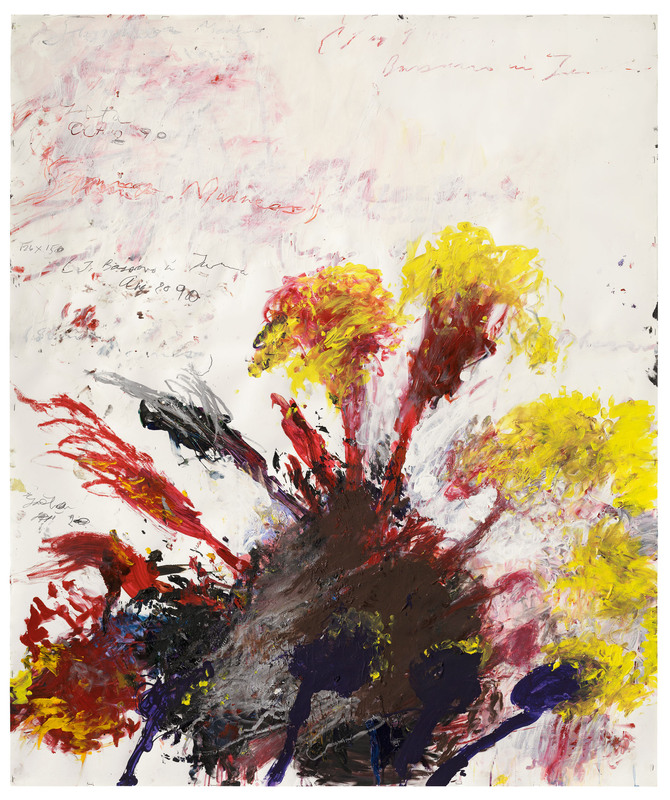 For the Bacchus series, painted at Twombly’s Gaeta studio in early 2005, in the midst of the Iraq War, the artist remembered again Homer’s Iliad and returned to the very characteristic writing he had explored in the “Black Paintings” of the late 1960s. Here, however, he replaced the white wax crayon with red paint evocative of both blood and wine, allowed to run freely across the vast beige canvases. The first series consisted of eight monumental paintings that were shown in late 2005 at the Gagosian Gallery on Madison Avenue in New York. 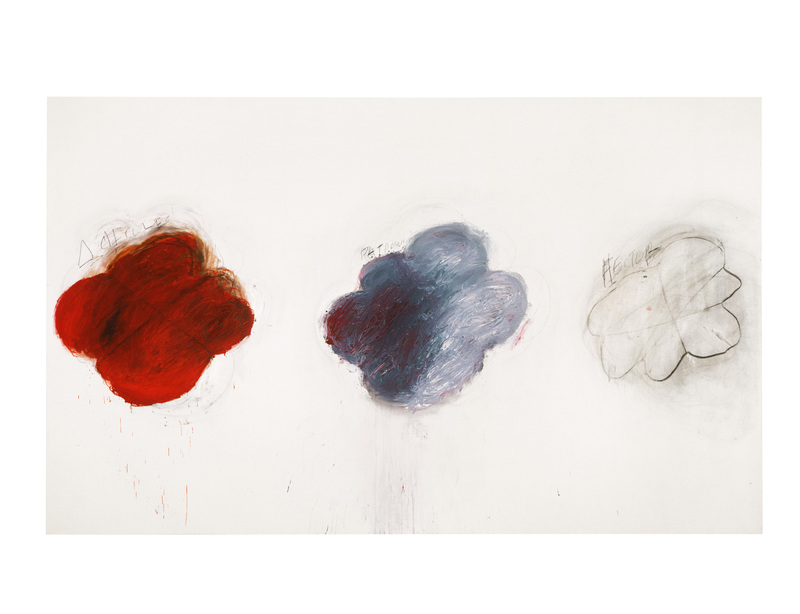 Between 2006 and 2008, Twombly produced another series on the theme of Bacchus, some of these paintings being even larger in format. The two works here are from the first series. as if yours to keep. 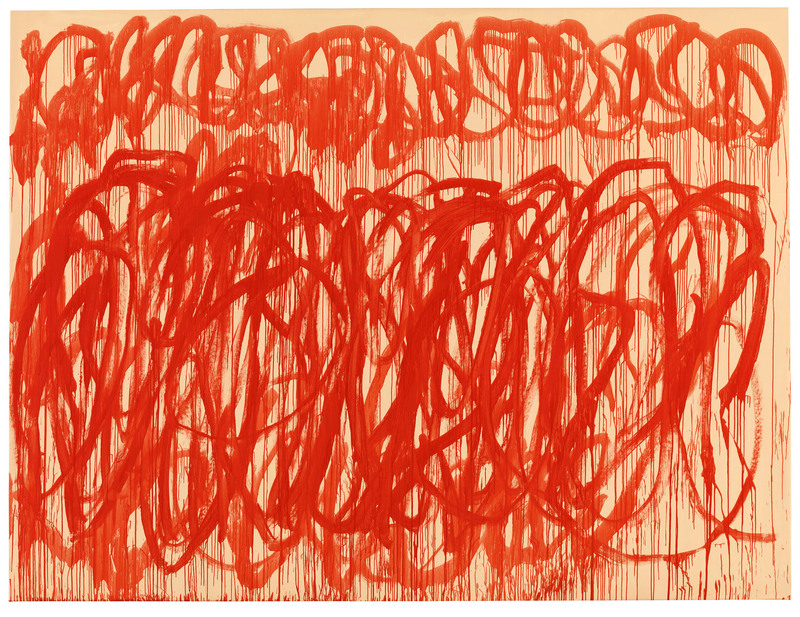 Either side of this ambiguous celebration of bodily oblivion, Twombly’s sequence tracks the energetic course of the Pharaonic conquerer, Sesostris II. 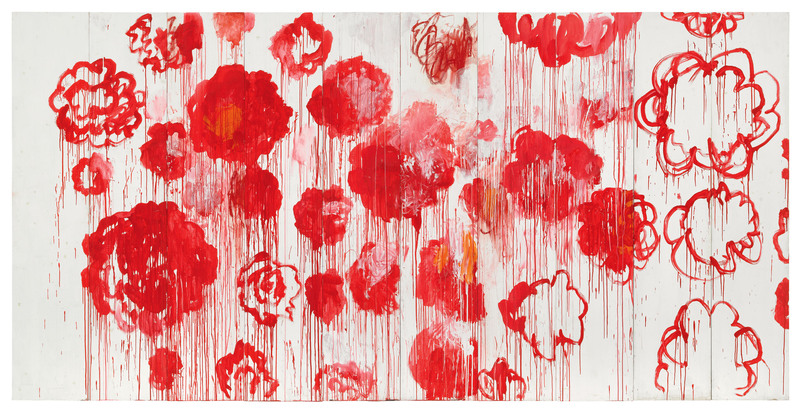 Rich and complex, the work of Cy Twombly, who passed away in 2011, spans a period of some sixty years without ever losing any of its force, even in the very last years of the artist’s life. 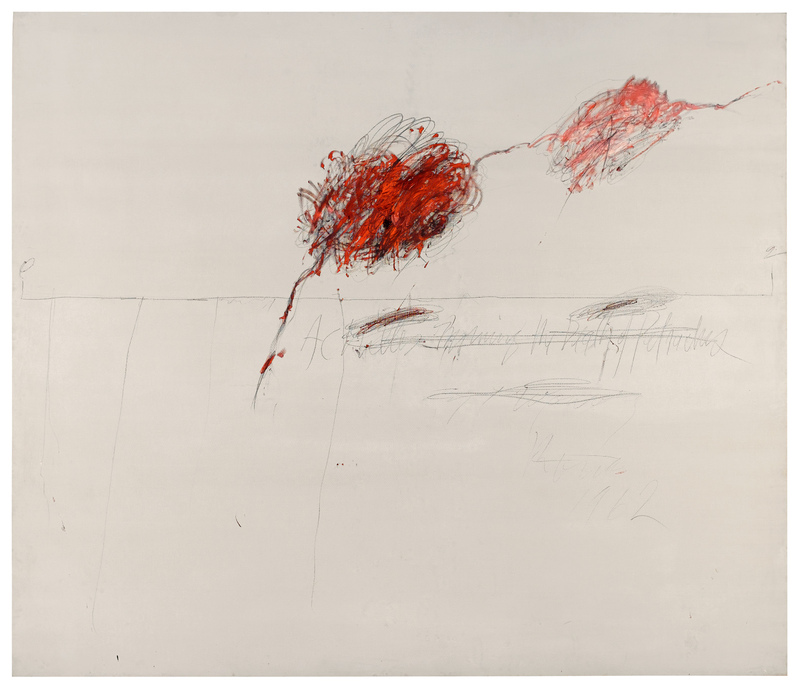 One of the most productive in recent history, Twombly’s career links the culture of post-war America, dominated artistically by Abstract Expressionism, and the Classical Mediterranean culture that he discovered as a young man and made his own. The artist would remain very close to the world of his birth, that of the Southern United States, better known in Europe for its literature, with William Faulkner, Carson McCullers, Flannery O’Connor, Truman Capote and more. From his childhood and youth in Lexington, Virginia, where he grew up under the attentive eye of his African-American nanny, Lula Bell Watts, he retained the characteristic and sometimes difficult-to-understand accent of the South. The boy’s family environment seems to have stimulated his intellectual curiosity, cultivated his sensibility and encouraged an interest in painting. When in 1952, at the age of 24, he applied for a grant to travel to Europe, he said he wanted “to study the prehistoric cave drawings of Lascaux.” He also planned to view French, Italian and Dutch museums, Gothic and Baroque architecture, and Roman ruins. 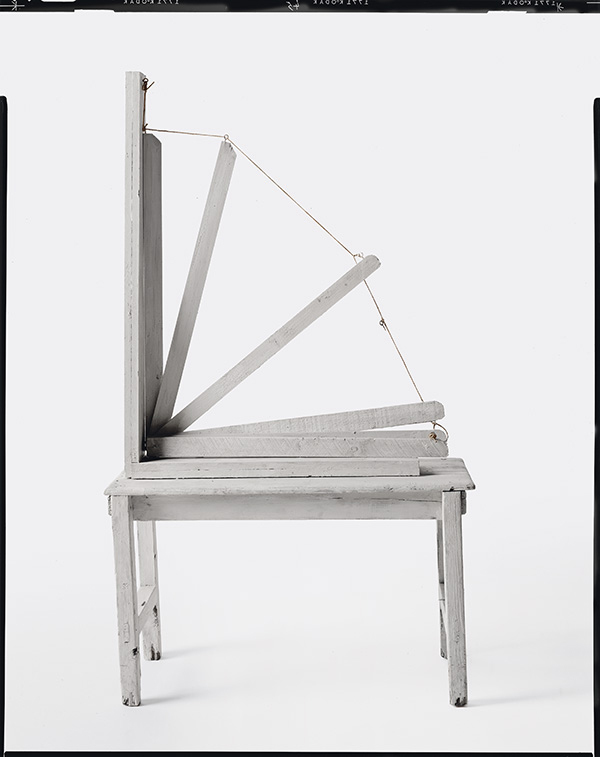 He also declared himself to be “drawn to the primitive, the ritual and fetishistic elements, to the symmetrical visual order.” Once he had his grant, he invited the artist Robert Rauschenberg, whom he met in New York two years earlier, to accompany him. They took a ship for Naples on 20 August 1952. The rich and original culture that he acquired would nourish his work. His readings were also voyages – Goethe, Homer, Horace, Herodotus, Keats, Mallarmé, Ovid, Rilke, Sappho, Virgil – on which he would draw for his creation. He found inspiration too in less well-known authors, among them Lesley Blanch, Robert Burton, George Gissing and 13th-century Persian poet and mystic Jalāl ad-Dīn Muhammad Rūmī. This uncommonly refined sensibility found an expressive outlet in his painting. 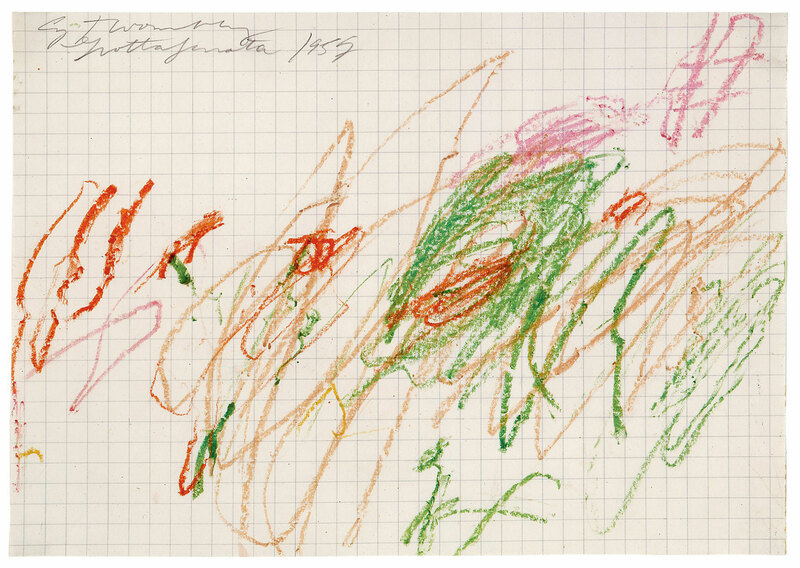 Yet while Twombly was indeed a highly cultivated and well-read painter, this was only one aspect of his complex personality. The sophistication of his work is accompanied by a constant attention to vernacular realities, visible to varying degrees but always present. 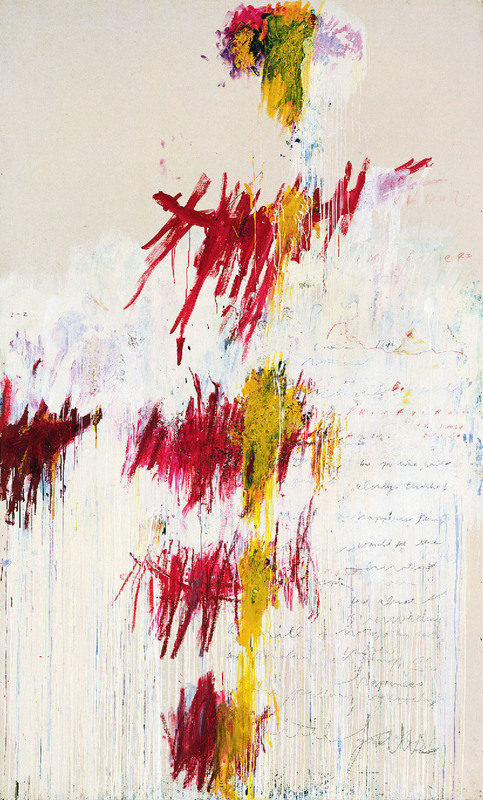 Endowed with a rare wit and humour, Twombly could be deliciously irreverent and even dirty-minded when he wanted. In front of his painting Apollo (1963), he remarked laconically to Paul Winkler, who used to be director of the Menil Collection in Houston: “Rachel and I used to love to go dancing at the Apollo Theater in Harlem”. And in a whole series of drawings from 1981-1982, he wrote the phrase “Private Ejaculations”, in the knowledge that in the 17th century it referred to short, intense prayer at regular intervals. 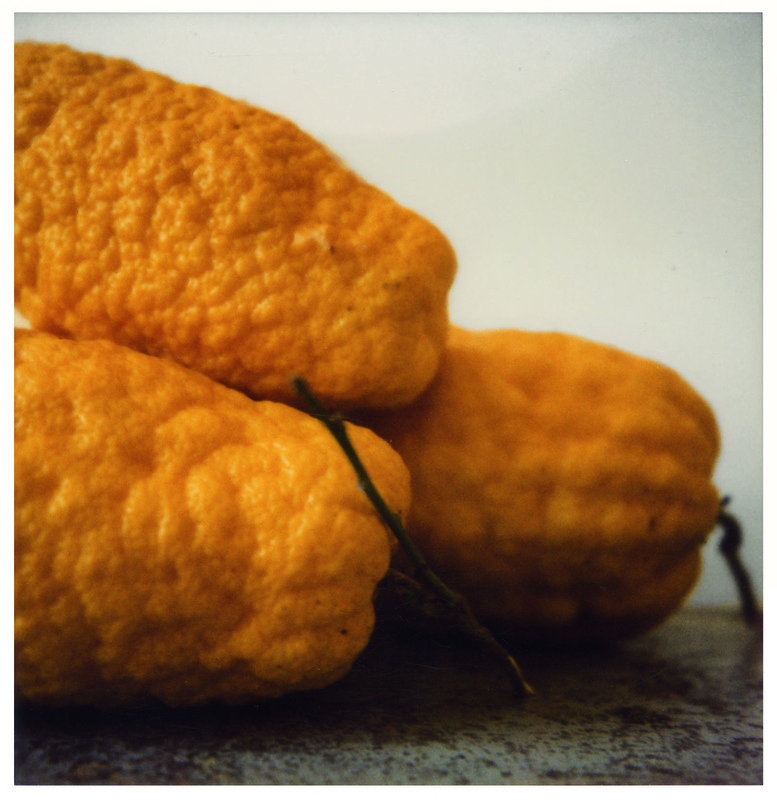 We know today, too, that photography played an important role in Twombly’s work and life. A private, even secretive man, he nonetheless regularly allowed himself to be photographed. Some of the most famous pictures of the artist were taken by Horst P. Horst for Vogue magazine, illustrating an article by Valentine Lawford entitled “Roman Classic Surprise” published in the November 1966 issue. 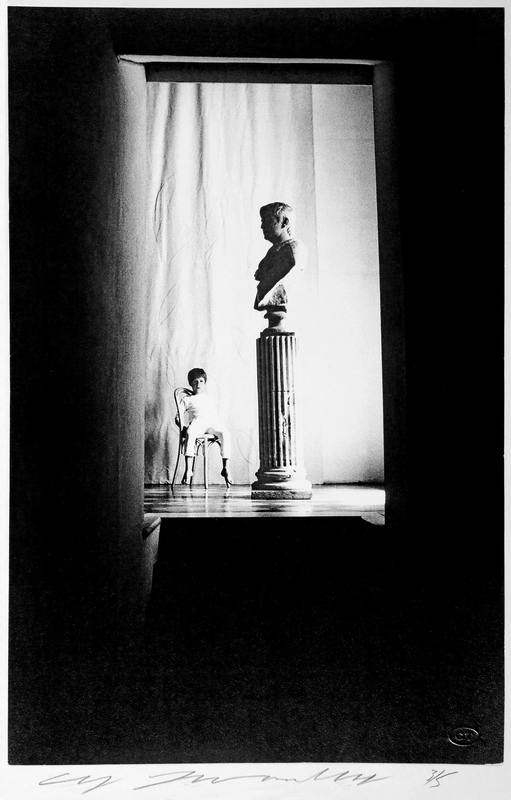 Taken in Twombly’s apartment in the Via Monserrato in Rome, the photographs reveal a dandy living in palatial accommodations. This appearance in Vogue did little to improve his relationship with the United States, at a low ebb since the controversy of the Nine Discourses on Commodus shown at Leo Castelli’s in New York. It was considered too smart and sophisticated: too distant, in brief, from the American idea of an American artist. 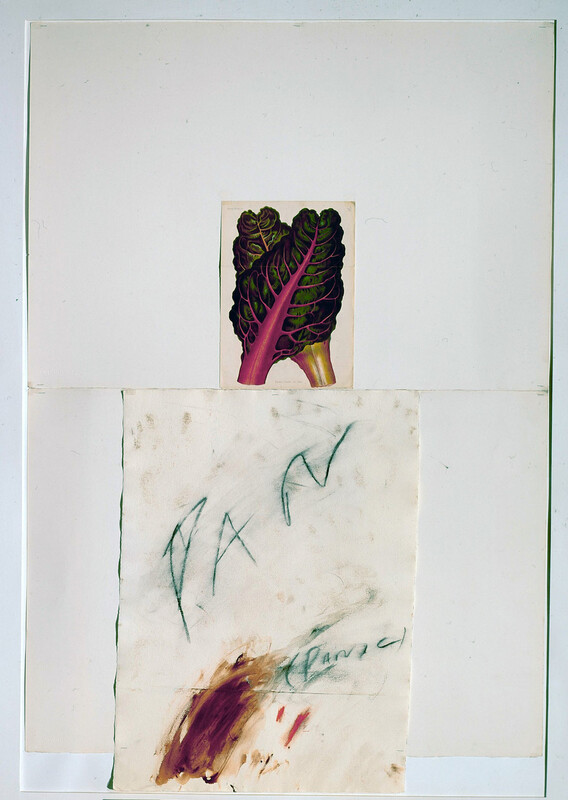 Twelve years later, in 1978, Heiner Bastian published the first monograph on Twombly’s painting, for which the artist took care to present himself differently. The cover picture shows him dressed in jeans and pull-over, boots on his feet, sitting on the ground beneath a tree, with sheep close by – an image intended to communicate an idea of an artist close to the earth, living a healthy and simple life. Twombly indeed was probably both, dandy and Roman shepherd. 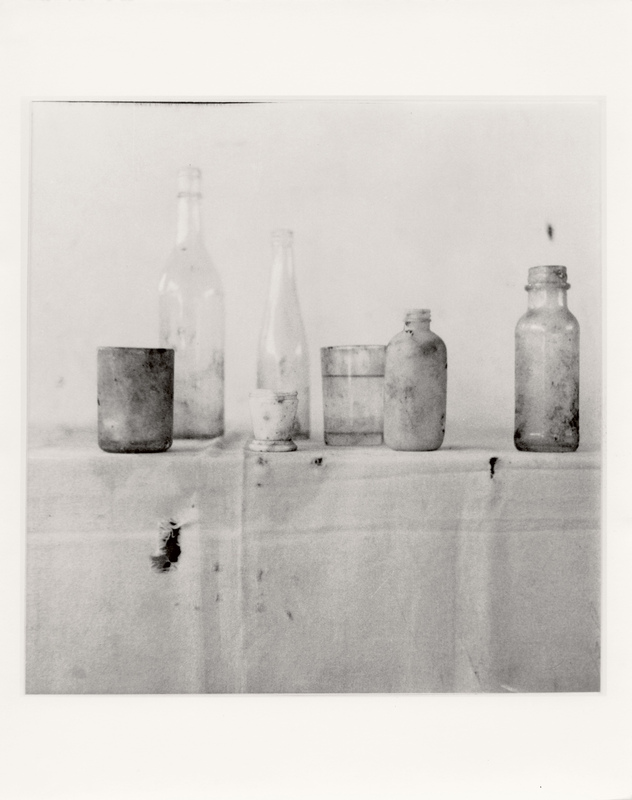 Sally Mann, a friend from Lexington, often photographed Twombly and his studio toward the end of his life. Thanks to her we have photos that document the development of the Coronation of Sesostris series, which he finished in the city of his birth. Among the most beautiful of the images are those of the studio, empty of work, with just traces of paint on the walls. 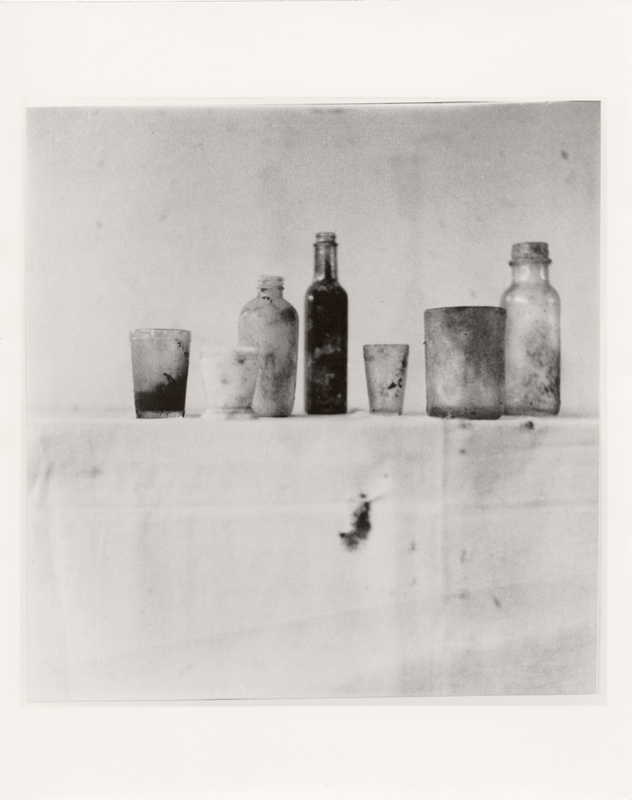 From some of these ghostly images of a whole phase of Twombly’s work, of his place of work and creation, Mann assembled an album, recently published as Remembered Light. Jonas Storsve in Code Couleur, no. 26, September – December 2016, pp. 18-23.